Formulated for ultra-modern show pigs needing muscle, cover and body, SHOWPIG 709 feed is a 18% protein, 6.5% crude fat, 1.1% lysine feed in a 3/32” pellet designed for greater intake. 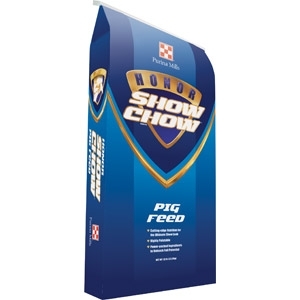 Honor® Show Chow® SHOWPIG 709 feed is supported by Purina knowledge, experience and research. Get your pigs on SHOWPIG 709 feed today so you can unleash your genetic investment. Click here for guaranteed analysis and more information.